The Princeton offense changed the way the game of basketball was forever played. Could the Tigers’ new three quarterback offense make an impact on the game of football as well? The old saying goes, “If you have two quarterbacks, you really don’t have any.” That adage does not ring true for three passers, however. Princeton currently is sitting pretty at 7-1 on the year and is averaging a whopping 44.25 points per contest. Knoxville native Quinn Epperly (No. 4) is the team’s leader, passing for 20 touchdowns and rushing for 16 more. Connor Michelsen (12) and Kedric Bostic (6) also sling passes for the Tigers. Could this work in the NFL? We don’t know, but we’ve got the perfect scenario to find out. Jacksonville is already in the toilet. Sign both Tim Tebow and Vince Young. Pair the two with rookie Denard Robinson, and you’ve got yourself three hyper-mobile guys who can at least play the position and definitely run zone-reads. You’re welcome, Jacksonville fans. 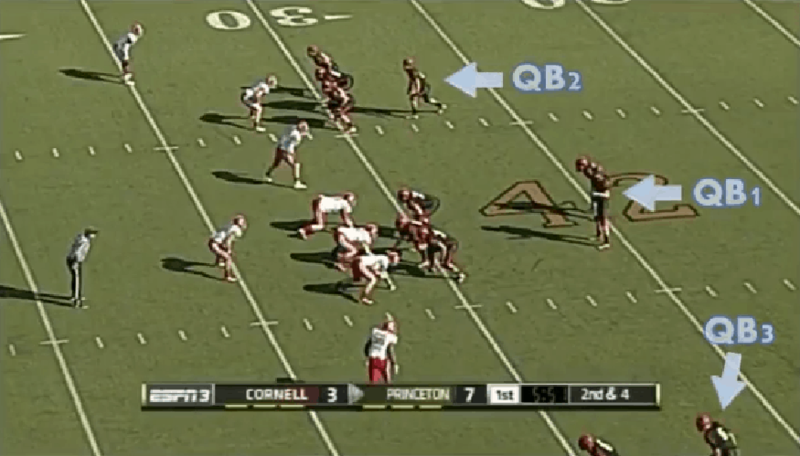 Check out Princeton’s three-headed QB threat doing work in a 53-20 drubbing of Cornell.